Many South Africans will remember Kim Shippey as the soundtrack to either the chaos of the rebel rugby tours or to the civility of the Wimbledon finals. Others will remember Shippey as a pioneer of radio and TV broadcasting in South Africa, having been the iconic host of everything from Sportsvision and Destinations to the quiz show Pick a Box and classical concerts. But most will simply remember that baritone voice which seemed to be everywhere in the ‘70s and early ‘80s, speaking with the same contagious fascination on almost every subject. Now 80 years old and living in the U.S., Shippey will mark 60 years in broadcasting in November. And he is still working nine-hour days full time, filing radio and editorial pieces for the Christian Science Monitor’s channels and periodicals. 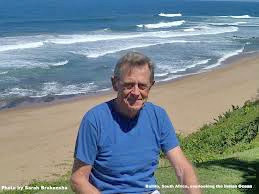 The father of five and grandfather of 11 has lived in Boston with his wife, Bobbi, since he left South Africa in 1986. And his has been a career in which, remarkably, its diversity has matched its longevity. While the biggest stars of radio in the U.S. or the U.K. today attract 10 million listeners, Shippey once commanded a nightly audience of 27 million with the BBC World Service and, later, 17 million as an anchor for BBC Television. He has interviewed everyone from Yul Brynner and Jesse Owens to Marlene Dietrich. Although he describes himself as “non-political,” he brought the action and egalitarian ideals of the Olympics to South Africans during the decades of isolation. And it was Shippey who, along with Gerhard Vivier, chose to remain on the air in 1971, when violent sports boycott protesters tried to topple their commentary booth to the ground. “I handled hard news, sports, film and book reviews, interviews, symphony concerts, and jazz,” he says. But unlikelier still is the fact that Shippey has had a broadcasting career at all. Brought up in Pietermaritzburg, KwaZulu-Natal, Shippey says he was so shy as a teenager that friends laughed when he mentioned his dream of working behind a microphone. At age 19, he applied for an announcer’s position at the SABC’s Aliwal Street studios and was told he was so poor that he should “never to try again.” Instead, he altered his study hours as a post-graduate student at Natal University, Pietermaritzburg, so he could spend four hours every day in voice training, often with a former broadcaster. “Whenever the family was out of the house, I took delight in reading every play by Shakespeare out loud to my dog, Dingaan,” he says. He then simply waited for the official who had failed him to leave the SABC, reapplied and landed the job. A few years later, during a four-year sojourn in the U.K., he competed with 5,000 candidates for an on-camera position with the BBC—and got the job. And his tips for aspiring South African broadcasters are specific. “In radio, have a camera on the tip of your tongue; in television, don’t state the obvious,” he says. “In so much broadcasting today, reporters speak as they write instead of speaking as we all speak in everyday conversation. I even hear words such as “latter” and “former” creeping into live news reports. The joy of live transmissions is that you can repeat words and names without any regard for what many journalists call elegant variation. I say repeat as much as you like—as long as the listener or viewer gets the message—and [state] the facts. And don’t offer “facts” till you know they are factual. Check, check and check again." But his central appeal is a humanitarian rather than journalistic. “Set the goal of enriching the lives of everyone you reach through your work. Give. Give. Give. I’m grateful to have had such an opportunity,” he says. For Shippey, a good life is simply an unselfish one, and he is not ashamed to allow his values to mold the tone of his journalism. Asked why he still works nine-hour days at 80, Shippey points out that the legendary cellist Pablo Casals was once asked why he continued to practice at age 90. He reportedly replied, "Because I think I'm making progress."